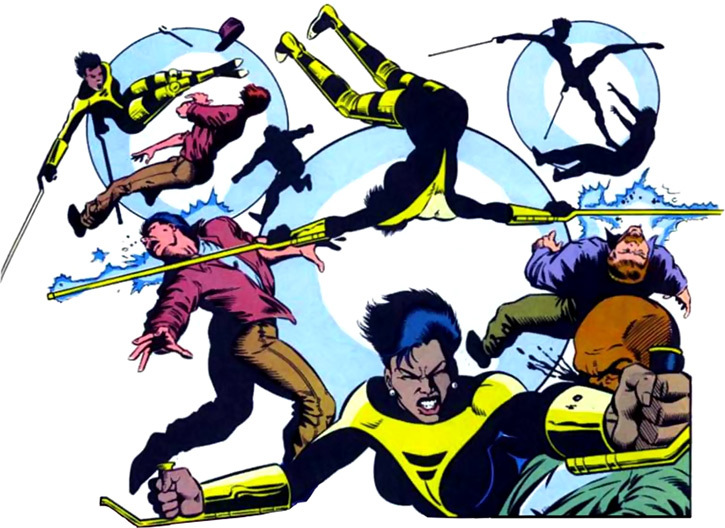 Silhouette was introduced to the New Warriors in 1990, as part of the tale of Night Thrasher’s shady past. At first she was mainly used for plot twists. Afterwards, she became more involved with the team. Dwayne and her had a romantic relationship, with highs and lows. So she also made appearances in Night Thrasher’s own series. Real Name: Silhouette “Sil” Chord. Known Relatives: Andrew Chord (father), Miyami Chord (mother), Midnight’s Fire (brother), Tai (maternal grandmother). Group Affiliation: New Warriors, Folding Circle, formerly Concrete Dragons (street gang). Base Of Operations: Manhattan (NYC). Height: 5’6” Weight: 105 lbs. Silhouette is a mutant with Darkforce abilities allowing her to melt into shadows. In dark areas, she can become totally invisible. She can also disappear from where she is and reappear in any dark or shadowy area within a several miles radius. However, her normal clothes are not teleported along, unless they’re made of Unstable Molecules™. This leads to rather embarrassing situations (for others, as she doesn’t seem to be bothered by walking around naked). She received the same combat training as her brother, Midnight’s Fire. Then, they teamed with Night Thrasher and perfected their training together. During her young career as a vigilante, she was shot in the back. She got out alive but with serious spinal damages. She is still able to stand up unassisted, but it requires a particularly difficult effort. She normally uses a pair of crutches (and some leg prosthesis). She got really familiar with the crutches and can move just as fast and efficiently with it as she used to before her accident. 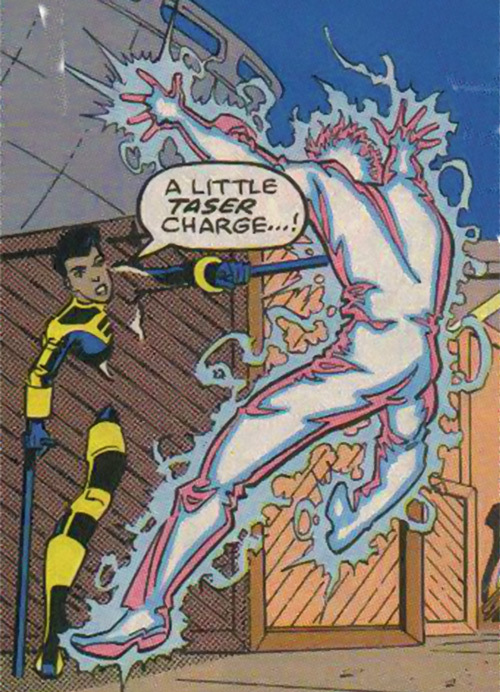 Night Thrasher built her a pair of combat crutches packing a powerful hidden taser. He also duplicated Reed Richard’s design and made her first Unstable Molecules. Later, after The New Warriors fought along The Fantastic Four against Terrax, Richards made her several other outfits and didn’t held a grudge against Night Thrasher for ripping his patent. Silhouette and her brother didn’t know who their father was. Their mother supposedly died when they were babies. They believed they were orphans. They started their vigilante activities. They were particularly good at building scams to infiltrate drug dealing gangs and destroying them in the middle of a business conclusion. During one of these, Dwayne Taylor, yet to become Night Thrasher, mistook them for actual drug dealers. After dispelling the misunderstanding, the three of them partnered to fight crime. Silhouette and Night Thrasher even partnered period. Then, during one of their scams, a cop interfered. Midnight’s Fire was ready to throw a knife to protect her. Night Thrasher stopped him. The thug Silhouette was talking to opened fire with his assault rifle. His burst hit the cop. The cop had the opportunity to return fire in the middle of the burst. The burst ended in Silhouette’s back. She survived her injuries but was left with spinal damages paralyzing her legs. Midnight’s Fire held Night Thrasher responsible and he scarred him in the face before leaving with Sil. Several years later, Midnight’s Fire set a ruthless leadership on the Concrete Dragons street gang in Chinatown. He used revenge toward Night Thrasher as an excuse to justify crossing lines. He hid a weapons’ traffic to Silhouette. The New Warriors interfered. Night Thrasher and Midnight’s Fire went at each other to settle old scores. Silhouette stopped them to Dwayne’s surprise as he thought her dead. Understanding her brother was beyond the pale, she rejected him. She let him be taken to prison. 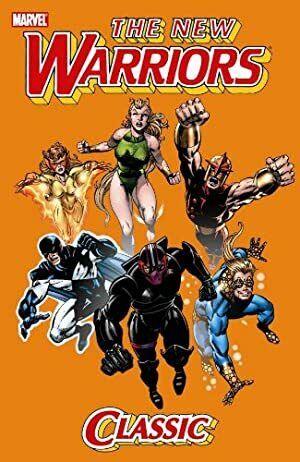 Afterward, she keeps teaming up with The New Warriors, on several occasions, but never permanently. She gets involved in cases related to her, her brother or Night Thrasher. During one of those cases, she discovered that Tai, Night Thrasher’s old Asian “maid” is her grand mother. Chord, Night Thrasher’s confident is her father. Her mother was not dead until Tai recently killed her. As part of a cult in Cambodia, Tai selected American soldiers, during the Vietnam War, to breed powerful beings. Those children were supposed to be able to harness the power of the cult’s artifact: The Well of All Things. Later, one of those soldiers, Diego Cassias, stole the power of the well from his own child. He became The Left Hand. He gathered the other children to found the Folding Circle group. With The New Warriors, they battled Tai over the power of the Well. They won. Tai and Left Hand apparently died. The remaining members of the Folding Circle ended up in Madripoor. They overthrew a local drug-lord. Later, Silhouette and Night Thrasher stopped them. Silhouette and Night Thrasher became lovers again. But his anger and obsession with his mission drove her away. She hooked up with Bandit, a recent recruit of The New Warriors, who happens to be Dwayne’s half brother. They left the team and settled in Chicago. Silhouette’s Asian heritage shows more than her brother. She has no typical Black features except her skin. She has a fine nose, wide eyes and straight hair. She keeps her hair short. She dresses in comfortable casual clothes, wearing trousers only, to fit her legs’ prosthesis. During a fight she always keeps moving and jumping. Her easiness to move with her crutches tricks many opponents to think her helpless, until they violently get the crutches in the face. Silhouette is an independent woman. She managed to deal with her infirmity alone. She’s proud to be able to cope by herself. Her vigilante’s career witnessed several setbacks. She’s not always so confident when she picks her fights. Invisibility in shadows or partial darkness (-1). Teleportation must arrive in a shadow or partially dark area (-1). Teleportation is Self Only (-1) and clothes are excluded unless made of Unstable Molecules (0). Teleportation of held objects is possible if she spends HP equal to 1+AP of weight (0). New Warriors (Low), Punisher (Low), Street (High), Night Thrasher (High). Mistrust (Mutant), MIA (Night Thrasher), SPR (Partial legs paralysis, see Special below), Uncertainty. Combat Crutches [Bod 06, EV 02 (04 w/Str, 07 w/Martial Artist), Jumping: 00, Lightning: 09, Limitations: Lightning has No Range (-1) and Catastrophic Power Burnout (-3), Advantage: Misc (negates SPR)]. UNSTABLE MOLECULE COSTUME [Bod 05, Cold Immunity: 01, Advantage: Insta Change]. She can stand up and move without crutches for 1 phase per scene without penalty. To stand longer than 1 phase costs 5 HP per extra phase. If she’s reduced to crawling, her Dex drops to 2 (along with linked Martial Artist, Thief and Weaponry) and Acrobatics drops to 0. Later, she gains a better mastery of her teleportation power. The Self Only limitation disappears. However, it’s still hard to teleport others. Teleporting others is considered Serious Marginal (grants a equivalent -1 FC as only part of the power is marginal). It is clear she cannot teleport her clothes unless they’re made of Unstable Molecules. 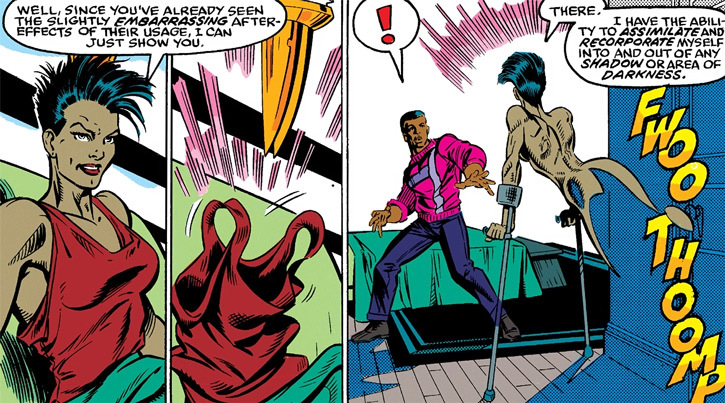 However, it is not clear if she can teleport her crutches. 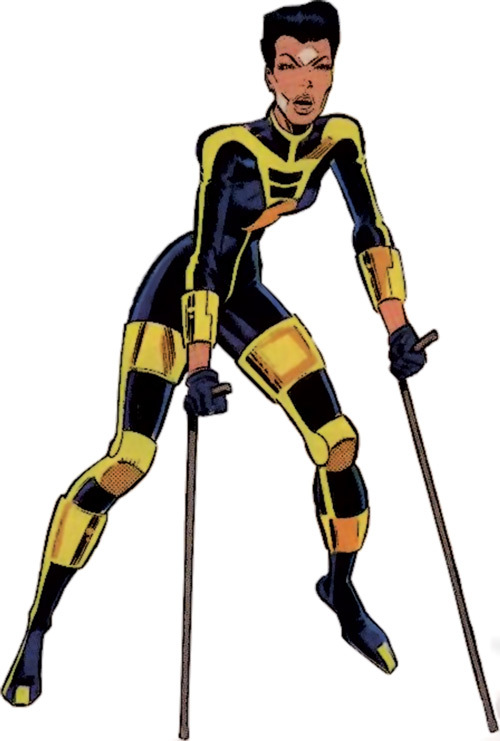 When she first displayed the ability, while evading The Punisher, she left the crutches behind with her clothes. Later, on many occasions, she kept her crutches. They can’t also be made of unstable molecules (that’s for clothing). Treat it as a form of Minor Marginal limitation, paying HP to transport equipment (it hardly qualifies for a -1FC). Unstable Molecules are seldom described with Gadget stats in WORG. Though they are seen everywhere in the Marvel Universe. BODY ranges from 5 to 8: their instability makes them very difficult to tore apart. Insta Change is a cheap way (5 HP) to translate an effect with rather low impact on the game: adapting to the powers of the user without being destroyed and leaving him naked. Without it, a lot of game time would be lost to role-play the embarrassment of the characters and possibly arrests for exhibitionism. In the particular case of Silhouette, though, this should be role-played unless she actually wears her Unstable Molecule costume. Source of Character: Marvel Comics (New Warriors). Helper(s): Peter Piispanen, Darci, Sébastien Andrivet, Pufnstuff. Writeup completed on the 18th of August, 2015.